Still in the circle: with close eyes focus on the part in your body that needs more attention today and ask yourself why you are here. Express this by means of some markers, pencils and the paper that are in front of you, before sharing with the group. Now we are standing in the circle and we start to shake our bodies but with the feeling that something is pulling us up by our rabbit ears. We keep on shaking. All parts of our bodies shakes, now our shoulders (as if repeating ,,who cares,, who cares,, ,,who cares ). Come to the sillness and start to balance your body, still having in your mind the imaginary ears of the rabbit that you have. Shifting balance, feeling the energy, the flowing sensation, being aware what happens with your breath. We touch our own bodies. Don’t forget about your feet and your head. (Here and now its the place to bring back importance to our head. So overused in daily life, often being subject of efforts. We can be gentle and indulgent to it again). Move in your kinesphere, as a bubble. Reach your peripheries. Feeling the bubble surrounding you. Painting it with your extremeties. When we as a group move toward indicated direction (for example door or window) we imagine one part is always dominating (,, legs up,, ,, and now ears ,,up and down, toward and backward). Slowly find a way to the floor, feel your own body as you lay alone. Check how you feel. Feel the support of the earth under neath you. You are here. However you are now, be with it. You are enough! Slowly roll to your side to get up to standing. Find your partner. Stand face to face. Look at his/her eyes as if you are looking into the mirror. One person starts to initiate very slow movement – starting with hand its easier. The other tries to mirror. So, one person follow and imitate this movement and they become mirror. There is no leader. Both people can initiate this movement but they don’t stop moving. The person who is leading will understand the moment when other is taking initative. We don’t intend to trick partner and mislead him. We wish to become one. Note: don’t hesitate to drift away from your partner, you can still be mirror not being in the touch distance. We are slowly coming to the end. Are you sure you are still your reflection? Try to find the final pose with your partner to that journey. Close your eyes and recall all memories from that dance. 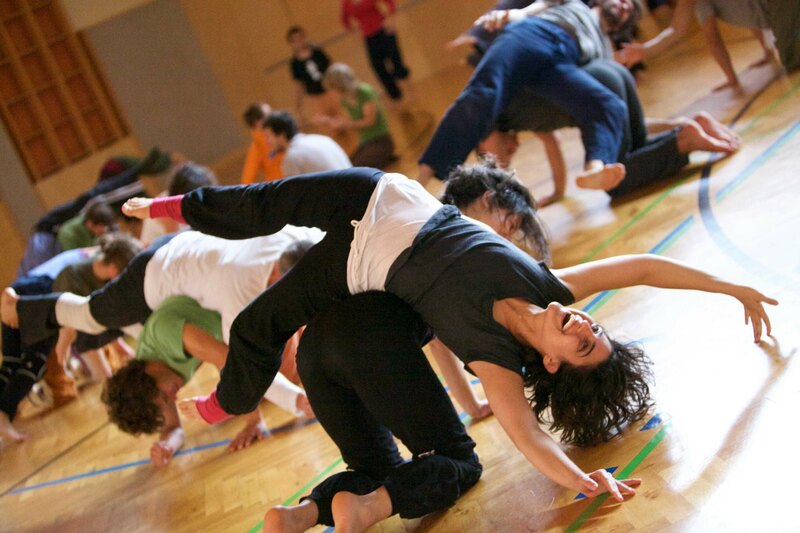 Skinesphere to Kinesphere parnter dance: One partner stands still and follows all the changes in his/her body (small dance), other moves in the kinesphere of his/her standing partner – composing, responding, resonating in the negative spaces. Dancing person finds the source of energy in the standing person energy. 3-4 mins each partner. Visiting the imaginary house of your partner ( Ryuzo Fukuhara’s exercise) Again dancing in the negative space of your standing partner, imagining a house in his body and visiting these rooms of the house as you dance around him. Dancing with our body and imagination. Try to really imagine details in the rooms as you dance there. 3-4 mins each partner. Rebuilding a house together with partner – Both partners are moving together in and around eachother and building a emphemeral, imaginary structure in the space by utilising all the tools they have achived along the previous exercises. Coming to stillness and listening to your own body. Türkçe notlar gönüllü tercüme yapacak dostları bekliyor! Destek atmak isterseniz info@ci-turkey.org adresine mail atın lütfen.